For other uses, see Grumman (disambiguation). The Grumman Aircraft Engineering Corporation, later Grumman Aerospace Corporation, was a leading 20th century U.S. producer of military and civilian aircraft. Founded on December 6, 1929, by Leroy Grumman and partners, it merged in 1994 with Northrop Corporation to form Northrop Grumman. Leroy Grumman and others worked for the Loening Aircraft Engineering Corporation in the 1920s, but when it was bought by Keystone Aircraft Corporation and the operations moved from New York City to Bristol, Pennsylvania, Grumman and his partners (Edmund Ward Poor, William Schwendler, Jake Swirbul, and Clint Towl) started their own company in an old Cox-Klemin Aircraft Co. factory in Baldwin on Long Island, New York. All of the early Grumman employees were former Loening employees. The company was named after Grumman because he was its largest investor. The company filed as a business on December 5, 1929, and opened its doors on January 2, 1930. Keeping busy by welding aluminum tubing for truck frames, the company eagerly pursued contracts with the US Navy. Grumman designed the first practical floats with a retractable landing gear for the Navy, and this launched Grumman into the aviation market. The first Grumman aircraft was also for the Navy, the Grumman FF-1, a biplane with retractable landing gear. This was followed by a number of other successful designs. During World War II, Grumman became known for its "Cats", Navy fighter aircraft, F4F Wildcat and F6F Hellcat, and the less well known Grumman F7F Tigercat and Grumman F8F Bearcat (neither of which saw combat during World War II), and for its torpedo bomber TBF Avenger. Grumman ranked 22nd among United States corporations in the value of wartime production contracts. Grumman's first jet aircraft was the F9F Panther; it was followed by the upgraded F9F/F-9 Cougar, and the less well known F-11 Tiger in the 1950s. 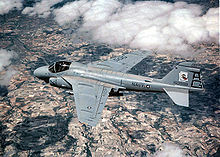 The company's big postwar successes came in the 1960s with the A-6 Intruder and E-2 Hawkeye and in the 1970s with the Grumman EA-6B Prowler and F-14 Tomcat. Grumman products were prominent in the film Top Gun and numerous World War II naval and Marine Corps aviation films. The U.S. Navy still employs the Hawkeye as part of Carrier Air Wings on board aircraft carriers, while the U.S. Marine Corps, the last branch of service to fly the Prowler retired it on March 8, 2019. Grumman was the chief contractor on the Apollo Lunar Module that landed men on the moon. The firm received the contract on November 7, 1962, and built 13 lunar modules. As the Apollo program neared its end, Grumman was one of the main competitors for the contract to design and build the Space Shuttle, but lost to Rockwell International. The company ended up involved in the shuttle program nonetheless, as a subcontractor to Rockwell, providing the wings and vertical stabilizer sections. In 1969 the company changed its name to Grumman Aerospace Corporation, and in 1978 it sold the Grumman-American Division to Gulfstream Aerospace. 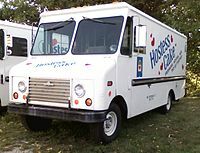 The company built the Grumman Long Life Vehicle (LLV), a light transport mail truck designed for and used by the United States Postal Service. The LLV entered service in 1986. Grumman was responsible for a successful line of business aircraft including the Gulfstream I turboprop (Grumman model G-159) and Gulfstream II business jet (Grumman model G-1159) which were operated by a number of companies and private individuals as well as by government agencies including various military entities and NASA. In addition, the Gulfstream I propjet was operated by several commuter/regional airlines in scheduled passenger services and included a stretched version, being the Gulfstream I-C (Grumman model G-159C) which could transport 37 passengers. Gulfstream business jets continue to be currently manufactured by Gulfstream Aerospace which is a wholly owned subsidiary of General Dynamics. For much of the Cold War period, Grumman was the largest corporate employer on Long Island. Grumman's products were considered so reliable and ruggedly built that the company was often referred to as the "Grumman Iron Works". As the company grew, it moved to Valley Stream, New York, then Farmingdale, New York, finally to Bethpage, New York, with the testing and final assembly at the 6,000-acre (24 km2) Naval Weapons Station in Calverton, New York, all located on Long Island. At its peak in 1986 it employed 23,000 people on Long Island and occupied 6,000,000 square feet (560,000 m2) in structures on 105 acres (0.42 km2) it leased from the U.S. Navy in Bethpage. The end of the Cold War at the beginning of the 1990s reduced defense spending and led to a wave of mergers as aerospace companies shrank in number; in 1994 Northrop bought Grumman for $2.1 billion to form Northrop Grumman, after Northrop topped a $1.9 billion offer from Martin Marietta. Grumman Olson built aluminum truck bodies, known as stepvans. Under the Grumman Olson brand it made the P-600 and P-6800 step vans for UPS. Grumman manufactured fire engines under the name Firecat and aerial tower trucks under the Aerialcat name. The company entered the fire apparatus business in 1976 with its purchase of Howe Fire Apparatus and ended operations in 1992. Grumman canoes were developed in 1944 as World War II was winding down. Company executive William Hoffman used the company's aircraft aluminum to replace the traditional wood design. The canoes had a reputation for being sturdier, lighter and stronger than their wood counterparts and had a considerable market share. Grumman moved its boat making division to Marathon, New York in 1952. Outboard Marine Corp. bought the division in 1990 and produced the last Grumman-brand canoe in 1996. Shortly thereafter former Grumman executives formed the Marathon Boat Group to produce the canoes. In 2000 the Group worked out an agreement with Northrop Grumman to sell the canoes using Grumman name and logo. The Grumman canoes with its logo are used in the film Deliverance. In 1984 Grumman leased the first superconducting MRI in Manhattan to East River Medical Imaging then known as S-K Magnetic Resonance Imaging, P.C. ^ "Air Warfare". An International Encyclopedia, Volume Two, M-Z, Volume 1, pp. 270–271. ^ a b c d e f Jordan, Corey C. "Grumman's Ascendency: Chapter One." Planes and Pilots Of World War 2, 2000. Retrieved: July 22, 2011. ^ "EA-6B Prowler, one of the saltiest warfighters in the Marine Corps, retires", "MarineTimes"
^ "Facts You Didn't Know About Long Island Businesses". Newsday. Newsday. Retrieved January 28, 2019. ^ "Long Islanders Shocked by Grumman's Merger." The New York Times, March 8, 1994. ^ a b "Commercial Property/Selling Off Northrop Grumman's Surplus; Cablevision Takes Last of the Grumman Buildings." The New York Times, December 28, 1997. ^ "Northrop Bests Martin Marietta to Buy Grumman." The New York Times, April 5, 1994. ^ a b c Jordan, Corey C. "Grumman's Ascendency: Chapter Two." Archived March 25, 2012, at the Wayback Machine Planes and Pilots Of World War 2, 2000. Retrieved: July 22, 2011. ^ Jordan, Corey C. "Grumman's Ascendency: Chapter Three." Planes and Pilots Of World War 2, 2000. Retrieved: July 22, 2011. ^ Library, Beth OljaceAnderson Public. "Howe Fire Apparatus had know-Howe". Herald Bulletin. Retrieved March 9, 2019. ^ "Paddling a Canoe to Success." Newsday. Retrieved: May 15, 2009. ^ "Marathon BoatGroup: About Us." Marathonboat.com. Retrieved: May 15, 2009. Fetherston, Drew. "Pioneers on the Runway: Raising Grumman." LI History.com, Grumman Park. Retrieved: March 18, 2009. Kessler, Pamela. "Leroy Grumman, Sky King." The Washington Post (Weekend), October 11, 1985. O'Leary, Michael, ed. "Leroy Grumman." Air Classics, Volume 19, no. 2, February 1983, pp. 27–29. Skurla, George M. and William H. Gregory. Inside the Iron Works: How Grumman's Glory Days Faded. Annapolis, Maryland: Naval Institute Press, 2004. ISBN 978-1-55750-329-9. Tillman, Barrett. Hellcat: The F6F in World War II. Annapolis, Maryland: Naval Institute Press, 2001. ISBN 0-87021-265-6. Treadwell, Terry. Ironworks: Grumman's Fighting Aeroplanes. Shrewsbury, UK: Airlife Publishers, 1990. ISBN 1-85310-070-6. Wikimedia Commons has media related to Grumman Aerospace Corporation.